The one thing that isn’t all dandy about our favorite saw selection, however, is that Corona doesn’t make a scabbard for their big-box-store, consumers-and-down model. A while back, I made one with some plexiglass and some HDPE spacers, bolted together with small machine screws and locknuts. Well, now I have a Shapeoko XL, so I figured it was high time I made a new scabbard (and one for Mike, too, as he’s basically “Associate Doer of Stuff”). I picked up a half-inch thick 15x20" HDPE cutting board from Sam’s, and if I squeezed everything in, I’d just be able to make four scabbard halves from it. 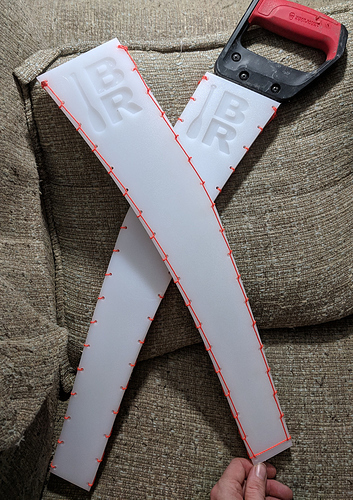 I took a photo of the blade and did a quick tracing in Inkscape, then played with the layout until I could get everything just right. In order to have the most space inside the scabbard (to make it as easy as possible to toss the saw back in while out in a canoe), I made the two halves mirror images with a 5mm pocket in each. I decided not to attempt plastic welding nor to wish upon HDPE-capable adhesives. Instead, I’d just make holes on 1-inch centers down each side and then use some cord to stitch the halves together. (The Inkscape skills I learned on my double-spiral cribbage board made making the holes quite easy.) If the stitching ever gives out, it’s easy enough to replace, and it’s low-profile enough to be unlikely to grab things. Anyway, just a quick post-Christmas project while I wait for more tools to arrive so I can continue getting everything with my Shapeoko XL dialed in just the way I want it.